There are so many different body washes on the market and finding the right one can be difficult. Like most women I want my body wash to provide me with hydrated beautiful looking skin that also smells nice too. My skin (especially during the winter in the Midwest) is very dry and sensitive, so I need a product that moisturizes. I was so excited when I found out I would get to review Dials new Ultra Fresh Hydration Coconut Water body wash. My skin has really been suffering this winter from dryness and from hormone fluctuations after having baby. I’ve tried a few different body washes, soaps and lotions to combat my dry skin. I was pleasantly surprised after I used the new Dial hydrating body wash. My skin felt very smooth after I rinsed it off, which wasn’t happening with bar soaps. I could tell right away that I would not need to pile on tons of lotion after my shower because my skin already felt moisturized. Another feature of my body wash that is important to me, besides the obvious of cleaning and moisturizing, is to smell great! What I love about the coconut body wash is that it left me smelling so good I felt like I was on a Hawaiian vacation every time I got a wiff of myself. It was like a wonderful 5 second escape (from my daily routine of changing diapers, feeding, cleaning and playing with the kids). If you’re searching for a great new moisturizing body wash you have to give Dial coconut wash a try. You won’t be disappointed (unless you dislike coconut)! 2 lucky Tips 4 Savings readers will get a chance to win a Free bottle of Dial's new Coconut water Body Wash, simply enter for your chance below. 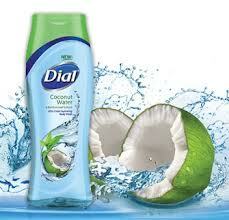 *Dial Soap provided me with a sample of New Dial Coconut Water Body Wash in exchange for a product review. However, all the opinions expressed here are my own. Depends, but usually body wash. Body because it rinses off thoroughly.